Looking for a healthy, live-food dish? Try this satisfying and easy to make salad I call "Avo-Veg Delight". In a large mixing bowl mash up avocado. Add all chopped vegetables, squeeze lemon, add cumin and optionally sea salt to taste. Mix up well. Lay out 3-4 large romaine lettuce leaves and add one large scoop of salad on each romaine leaf. Eat as a salad or wrap lettuce leaves around salad and eat burrito style! 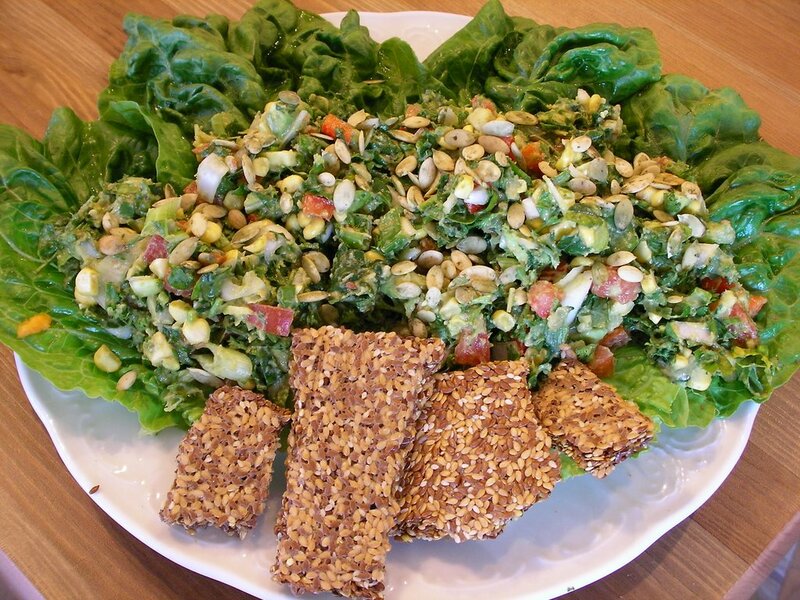 Enjoy with live flax crackers or your favorite veggies. This is a very satisfying dish! Enjoy experimenting with different veggies and have fun. Enjoy and all the best for your health...with living foods! Here are some pictures of delicious raw dishes I've prepared over the last few months. Recipes and more pictures to come. Enjoy! "Cooked starches are also very fattening. Farmers have even learned that is is necessary to feed their animals cooked food to fatten them up for maximum profit. Hogs do not get fat on raw potatoes, but cooked potatoes make them gain weight. In addition to reaching your body's ideal weight, many other beauty factors blossom on a raw diet. Cellulite, which is thought to result from eating heated fats, gradually disappears with the consumption of freshly squeezed grapefruit juice and raw fruits and vegetables. On a raw diet, improved elimination of cellular waste and increased lymphatic drainage help remove cellulite." "... arguably the most comprehensive book ever written on the raw diet and lifestyle"
Learn more about the book and get 80 valuable bonus gifts. Support Your Local Co-Op’s and Markets! Recently, the only co-op in the Phoenix area, Gentle Strength, and a leader in locally grown, organic produce, went out of business. Bottom line... not enough shoppers. Sure there were probably a few other reasons, but the main one was lack of business. It's funny, though, everyone I talk to in the area is disappointed and saddened by the closing (as I was). However, I believe there was too much talk and not enough action. If we want to have better, fresher, organic and locally grown choices, we have to support those organizations. Support them with our shopping dollars and with our help in letting others know about the organizations. Personally, I'll miss the co-op and the friends I've made there. They were the -only- central place to get fresh, locally grown greens and other produce. All the produce sold was organic and as much as possible was sourced locally. The only choices now are the national chains including Whole Foods and Wild Oats (now owned by Whole Foods), a few smaller chains and some traditional grocery chains that now carry some organic produce. I'm happy that they're all carrying more organic foods, although little, if any, is locally grown. Whole Foods advertises 'local' although a quick walk through shows just a few locally grown out of over 200 produce items. Alternative sources include farmers markets and visiting farms directly. I've found a few farms and frequent farmers markets on weekends and can find some of the same items. Although not as convenient, it's a solution for now. Find the local co-ops in your area and support them. It's a fact, traditional companies will continue to market non-organic products and source all over the world unless we 'vote' with our dollars. Using as much locally grown organic produce not only supports your community and the environment, the food is also more nutritious and benefits your health. We can make a difference.. just do it! Are You Dressing In Chemicals Today? Along with a diet rich in fresh, organically grown foods, consideration should be given to the clothes you wear as well. Not only for the fact that your skin is in constant contact with your clothing, but also for the way certain fabrics are made and their impact on our environment. It's been a very interesting 8 months! As you may know I've been focusing exclusively on raw, whole foods and have avoided most everything else including raw 'junk food'. This includes high fat avocados, dehydrated foods, processed foods, sauces, oils, bars and other foods that contain raw ingredients but have been processed. Basically I've eaten locally or organically grown fruits and veggies with a very limited about of nuts or seeds. There have been many benefits to this but the one thing that stands out for me has been the ability to feel how everything I eat affects me. I was fascinated with what I've learned.